This article is about the body of water. For other uses, see Cook Inlet (disambiguation). Cook Inlet (Dena'ina: Tikahtnu) stretches 180 miles (290 km) from the Gulf of Alaska to Anchorage in south-central Alaska. Cook Inlet branches into the Knik Arm and Turnagain Arm at its northern end, almost surrounding Anchorage. On its south end merges with Shelikof Strait, Stevenson Entrance, Kennedy Entrance and Chugach Passage. 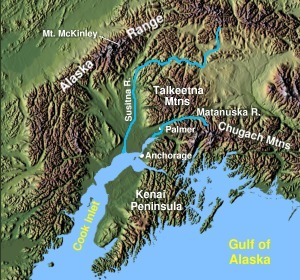 The watershed covers about 100,000 km² of southern Alaska, east of the Aleutian Range, south and east of the Alaska Range, receiving water from its tributaries the Knik River, the Little Susitna River, and the Susitna and Matanuska rivers. The watershed includes the drainage areas of Denali (formerly named Mount McKinley). Within the watershed there are several national parks and the active volcano Mount Redoubt, along with three other historically active volcanoes. Cook Inlet provides navigable access to the port of Anchorage at the northern end, and to the smaller Homer port further south. Before the growth of Anchorage, Knik was the destination for most marine traffic in upper Cook Inlet. Approximately 400,000 people live within the Cook Inlet watershed. 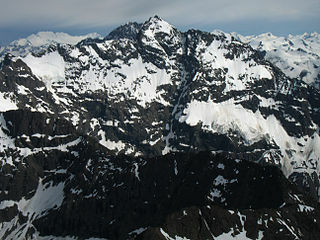 The Cook Inlet region contains active volcanoes, including Augustine Volcano and Mount Redoubt. Volcanic eruptions in the region have been associated with earthquakes and tsunamis, and debris avalanches have resulted in tsunamis also. There was an earthquake of the magnitude of 7.1 on December 31, 1901 generated by an eruption that caused several tsunamis. In 2009 a lahar from Mt. Redoubt threatened the Drift River oil terminal. The inlet was first explored and settled by Dena'ina people. In the 18th century, Russian fur hunters (promyshlenniki) were among the first European visitors. The Lebedev Lastochkin Company leader Stepan Zaikov established a post at the mouth of the Kenai River, Fort Nikolaev, in 1786. These fur trappers used Siberian Native and Alaska Native people, particularly Aleuts from the Aleutian Islands and Koniag natives from Kodiak, to hunt for sea otters and other marine mammal species for trade with China via Russia's then-exclusive inland port of trade at Kiakhta. Other Europeans to visit Cook Inlet include the 1778 expedition of James Cook, its namesake, who sailed into it while searching for the Northwest Passage. Cook received maps of Alaska, the Aleutians, and Kamchatka during a visit with Russian fur trader Gerasim Izmailov in Unalaska, and combined these maps with those of his expedition to create the first Mercator projection of the North Pacific. The inlet was named after Cook in 1794 by George Vancouver, who had served under Cook in 1778. Turnagain Arm was named by William Bligh of HMS Bounty fame. Bligh served as Cook's Sailing Master on his 3rd and final voyage, the aim of which was discovery of the Northwest Passage. 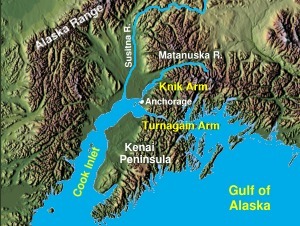 Upon reaching the head of Cook Inlet, Bligh was of the opinion that both Knik Arm and Turnagain Arm were the mouths of rivers and not the opening to the Northwest Passage. Under Cook's orders Bligh organized a party to travel up Knik Arm, which quickly returned to report Knik Arm indeed led only to a river. The S.S. Farallon was a wooden Alaskan Steamship Company liner that struck Black Reef in the Cook Inlet on January 5, 1910. All thirty-eight men on board survived, and were rescued twenty-nine days later. Few white people visited upper Cook Inlet until construction of the Alaska Railroad along the eastern shores of Turnagain Arm and Knik Arm of Cook Inlet around 1915. The natives of the Eklutna village are the descendants of the residents of eight native villages around upper Cook Inlet. During the 1964 Alaska earthquake, areas around the head of Turnagain Arm near Girdwood and Portage dropped as much as 8 feet (2.4 m) by subsidence and subsequent tidal action. Both hamlets were destroyed. Girdwood was later relocated inland and Portage was abandoned. About 20 miles (32 km) of the Seward Highway sank below the high-water mark of Turnagain Arm; the highway and its bridges were raised and rebuilt in 1964–66. Most of Alaska's population surrounds Cook Inlet, concentrated in the Anchorage, Alaska area and in communities on the Kenai Peninsula. The more remote west side of the inlet is not connected to the road system, and is home to the village of Tyonek, Alaska, and a number of oil camps. The Cook Inlet Basin contains large oil and gas deposits including several offshore fields. As of 2005 there were 16 platforms in Cook Inlet, the oldest of which is the XTO A platform first installed by Shell in 1964, and newest of which is the Osprey platform installed by Forest Oil in 2000. Most of the platforms are operated by Union Oil, which was acquired by Chevron in 2005. There are also numerous oil and gas pipelines running around and under the Cook Inlet. The main destinations of the gas pipelines are to Kenai where the gas is primarily used to fuel commercial fertilizer production and a liquified natural gas (LNG) plant and to Anchorage where the gas is consumed largely for domestic uses. Alaska has approximately half the known coal reserves in the U.S. For decades, there has been a proposal to build a large coal mine (the Chuitna Coal Mine) on the west side of Cook Inlet near the Chuitna River, and the native village of Tyonek, Alaska. American Rivers has placed the Chuitna River on its list of the 10 most endangered rivers for 2007, based on the threat of this mine. Turnagain Arm is one of only about 60 bodies of water worldwide to exhibit a tidal bore. The bore may be more than six feet high and travel at 15 miles per hour on high spring tides and opposing winds. Turnagain Arm sees the largest tidal range in United States, with a mean of 30 feet (9.2 m), and the fourth highest in the world, behind Bay of Fundy (11.7m), Ungava Bay (9.75m), and Bristol Channel (9.6m). The ocean's natural 12-hour 25-minute tidal cycle is close to Turnagain Arm's natural resonance frequency, which then reinforces the tide similar to water sloshing in a bathtub. Tidal fluctuations in the main body of Cook Inlet, while not as extreme as the shallow and narrow Turnagain Arm, regularly reach 25 feet (7.6 m) or more and exhibit currents in excess of 5 knots (9.3 km/h) at full tidal flow. The inlet and its arms have been proposed as a potentially attractive site for the generation of tidal power. Turnagain Arm and Knik Arm are known for large areas of silt. At low tide, much of this is exposed, making marine navigation difficult. Historically, ships and boats designed for the area had a relatively flat bottom with a modest centerboard and absence of a large keel because the boats would occasionally become beached at low tide either on purpose or by accident. This design allowed the craft to support its weight on land without sustaining any serious damage to its structure. An example of this design is the Nomad, a much photographed fishing boat once owned by Joe Reddington which has sat on a mudflat near Knik for several decades. These mudflats can also be dangerous to walk on, exhibiting quicksand-like characteristics, and have claimed the life of at least two people who have wandered out on them. Cruise ships dock at Seward on the Gulf of Alaska or Whittier in Prince William Sound and transport passengers via bus or train to Anchorage. However, over 95% of freight entering Alaska comes through the Port of Anchorage, which is served by major container ship companies and other carriers. The Cook Inlet beluga whale is a genetically distinct and geographically isolated stock. The population fell to 278 in 2005 and it is listed as critically endangered in the IUCN Red List of Threatened Species. This was perhaps due to local hunt, although a recent article in the Anchorage Daily News questioned this conclusion. In 2000, the US National Marine Fisheries Service listed the Cook Inlet beluga whale population as depleted and began development of a conservation plan. On October 22, 2008 the Cook Inlet beluga whale was put onto the endangered species list. Cook Inlet activities include commercial fishing, oil and gas development, release of treated sewage, noise from aircraft and ships, shipping traffic, and tourism. However, it is not known what impact these activities had on the beluga whale population. The Coastal Marine Institute at the University of Alaska Fairbanks's School of Fisheries and Ocean Sciences working with the U.S. Department of the Interior's Minerals Management Service (MMS), began a three-year project in 2003 focusing on the water circulation in Cook Inlet. Cook Inletkeeper, a member of the Waterkeeper Alliance, began in 1994 when a group of Alaskans became concerned about the rapid ecological changes in the inlet. The group formally incorporated the following year using settlement proceeds from a Clean Water Act lawsuit against Cook Inlet oil and gas producers. Their stated mission is to "protect Alaska's Cook Inlet watershed and the life it sustains," with a focus on clean water, healthy habitat, local economies, and energy. They are based in Homer. Wikimedia Commons has media related to Cook Inlet. ^ "Cook Inlet, Alaska". Archived from the original on June 11, 2007. Retrieved 2007-02-03. ^ United States Coast Pilot 9. "Coast Pilot 9 – 33rd Edition, 2015". Office of Coast Survey. page 182. Retrieved 28 November 2015. ^ "Cook Inlet-South Central Alaska map and volcano list". Alaska Volcano Observatory. Retrieved 2007-02-03. ^ "Augustine, Cook Inlet, Alaska". Archived from the original on 2007-02-04. Retrieved 2007-02-03. ^ "Historic Earthquakes – Cook Inlet, Alaska". Retrieved 2007-02-03. ^ Lloyd, Steve K. "The Farallon Shipwreck Project". WSU Press. Archived from the original on 28 July 2011. Retrieved 10 June 2011. ^ "Cook Inlet Oil and Gas". Retrieved 2007-02-03. ^ "Kenai, Alaska plant". agrium.com. Archived from the original on October 14, 2006. Retrieved 2007-02-03. ^ "Chuitna Coal Mine". inletkeeper.org. Archived from the original on July 1, 2007. Retrieved 2007-05-13. ^ "Frequently Asked Questions – Tide Predictions and Data". NOAA. Retrieved 2008-09-10. ^ "Tidal Energy". Ocean Energy Council. Archived from the original on 2008-05-13. Retrieved 2008-11-11. ^ Salequazzaman, M.; Newman, Peter; Ellery, Mark; Corry, Brendan. "Prospects of electricity from tidal power in coasl regions of Bangladesh" (PDF). Murdoch University, Perth, Western Australia: Journal of Bangladesh Studies. Archived from the original (PDF) on 15 February 2012. ^ Lemagie, Sarah (May 5, 2005). "Unusual Turnagain Arm tide has attractions and dangers". Anchorage Daily News. Archived from the original on May 5, 2005. ^ Michelle Theriault Boots (June 25, 2013). "Man who died on mud flats was Army attorney, outdoorsman". Anchorage Daily News. Archived from the original on February 1, 2014. ^ "Management and Recovery of Cook Inlet Beluga Whales". NOAA Fisheries. Retrieved 2007-02-03. ^ "Water and Ice Dynamics in Cook Inlet, Alaska". Retrieved 2007-02-03. ^ "Cook Inletkeeper - History". Cook Inletkeeper. Retrieved 2018-07-30. ^ "Cook Inletkeeper - Our Work". Cook Inletkeeper. Retrieved 2018-07-30. 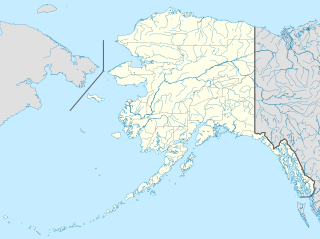 Beluga is a census-designated place (CDP) in Kenai Peninsula Borough, Alaska, United States. The population was 20 at the 2010 census, down from 32 in 2000. Knik Arm is a waterway into the northwestern part of the Gulf of Alaska. It is one of two narrow branches of Cook Inlet, the other being Turnagain Arm. Knik Glacier empties into the Knik Arm. The Port of Anchorage is located on the arm. Chugach State Park covers 495,204 acres immediately east of the Anchorage Bowl in south-central Alaska. Though primarily in the Municipality of Anchorage, a small portion of the park north of the Eklutna Lake area in the vicinity of Pioneer Peak lies within the Matanuska-Susitna Borough. Established by legislation signed into law on August 6, 1970, by Alaska Governor Keith Miller, this state park was created to provide recreational opportunities, protect the scenic value of the Chugach Mountains and other geographic features, and ensure the safety of the water supply for Anchorage. The park, managed by Alaska State Parks, is the third-largest state park in the United States, and consists of geographically disparate areas each with different attractions and facilities. Only Anza-Borrego Desert State Park in California and Wood-Tikchik State Park in western Alaska are larger. Hunting and fishing are permitted in the Chugach under regulations established by the Alaska Department of Fish and Game for game management unit 14c. Target practice is not allowed within the park boundaries. 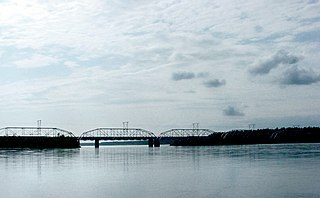 The Knik Arm Bridge is a dormant proposal for a 1.74-mile bridge across Cook Inlet's Knik Arm to link the two fastest growing parts of Alaska – Anchorage and the Matanuska-Susitna Borough. The Knik River is a 25-mile-long (40 km) river in the U.S. state of Alaska. Its source is at Knik Glacier, from which it flows northwest and west and empties into the head of Cook Inlet's Knik Arm, near the mouth of the Matanuska River. It is bridged twice where the Old Glenn Highway crosses it near the Butte, and also bridged on the Hayflats. Fire Island is a 5.5-mile (8.9 km) long island in the U.S. state of Alaska, located near the head of Cook Inlet at 61°09′34″N 150°11′55″W. It is the only island in the Municipality of Anchorage, sitting three miles (5 km) off the city's Point Campbell, and nine miles (14.5 km) from downtown. Its land area is 17.467 km2, and there was no permanent resident population at the 2000 census. Alaska is one of two U.S. states not bordered by another state; Hawaii the other. Alaska has more ocean coastline than all of the other U.S. states combined. About 500 miles (800 km) of Canadian territory separate Alaska from Washington State. 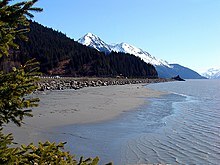 Alaska is thus an exclave of the United States that is part of the continental U.S. and the U.S. West Coast, but is not part of the contiguous U.S. Alaska is also the only state, other than Hawaii, whose capital city is accessible only via ship or air, because no roads connect Juneau to the rest of the continent. Cook Inletkeeper is a non-profit water conservation and ecology organization based in Homer, Alaska. Their stated goal is "promoting sound public policies that protect fish habitat and water quality; and holding individuals, industry and agencies accountable for habitat, water quality and human health in the Cook Inlet watershed. " The organization was founded in 1994 with funds from a legal settlement involving oil companies that extracted resources from Cook Inlet. They are part of the Waterkeeper Alliance. They were involved in pressuring the National Marine Fisheries Service to list the Cook Inlet population of Beluga Whales as endangered. They have also been active in opposing open-pit mining in the Cook Inlet area. They also manage a water quality laboratory in Homer that monitors 240 sites around Cook Inlet. In 2005, Robert F. Kennedy Jr. spoke in support of their efforts at the groups ten-year anniversary celebration. He stated that "The fish in that inlet belongs to the people. Everybody has a right to use them. Nobody has a right to use them in a way that will diminish or injure their use and enjoyment by others." Beluga Point Site (49ANC-054) is an archaeological location along Turnagain Arm of Cook Inlet, near Seward Highway Milepost 110, south of Anchorage, in the U.S. state of Alaska. It was added to the National Register of Historic Places on March 30, 1978. Campbell Creek is one of several streams that flow through the city of Anchorage, Alaska. It runs for 21 miles from the Chugach Mountains to the Turnagain Arm of Cook Inlet. Captain Cook State Recreation Area is a park on the Kenai Peninsula in Alaska. It is located on the shores of Cook Inlet at the northern terminus of the Kenai Spur Highway, about 25 miles (40 km) north of Kenai and 14 miles (23 km) north of Nikiski. Both the Inlet and the recreation area are named after Captain James Cook who explored the area in 1778. Glacier Creek is a stream flowing out of the Chugach Mountains, which enters the Turnagain Arm of Cook Inlet near Girdwood, Alaska.